I had heard of Art Nouveau before, but I didn’t think much of it until I encountered it again in Paris, France. The entrances of several metro stops were decked out in the style, one of the few visible remnants of the turn of the century that remain. But it wasn’t until I wandered into the Art Nouveau exhibit at the Orsay Museum that it captured my fancy. 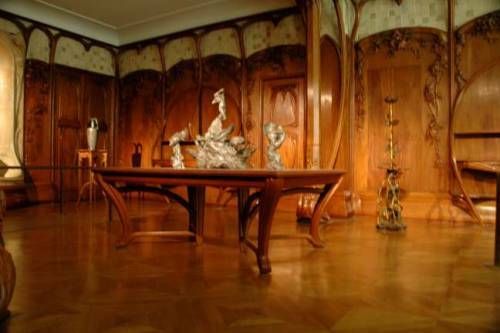 As I came to find out, Art Nouveau is more than a type of art—it is also a font face and a style of interior design, and it was this last aspect that I discovered in the museum. It seemed that the designers of these beds, desks, and chairs deliberately avoided sharp corners, and the result was furniture that curves and flows, imitating the contour of vines and branches. As I walked through the exhibit, it no longer felt like Paris—this was Lothlórien! It’s difficult to find words to describe the Art Nouveau style—it looks modern, but in an oldish sort of way. I wouldn’t be surprised at all if the artists who created these works were inspired by the woods and fields, which of course were designed by the Creator Himself.